I'm not afraid to say Norway's Orpheus and their debut album threw me a curve. Traveling through this disc the first time, I wasn't quite sure what to make of what I was listening to. First, I was confounded by the lead vocals. At times I thought I was hearing a strange metamorphosis of Geddy Lee only to discover that the leads were done by female vocalist Ingrid Galadriel (yes, like the Tolkein character). Ms. Galadriel is quite dynamic throughout, but often sounds like she's reaching when she invokes a more heavy metal tone. Often it became tiring. Second, the arrangements blended movements of metal and heavier melodic rock in a significantly complex manner to invoke a progressive label. Over against the lead vocals, the song composition is terrific. Songs like Constructing, Bygone, The Plan, and the lengthier Peepin' Tom offer intriguing developments and masterful twists that make for great music and an entertaining listening experience. The latter song, Peepin' Tom, is an application where less is more for vocalist Galadriel as she isn't pressed into so much screaming. Other songs did little to capture my interest including Bloodflow which seemed more like an excercise in excessive riffing. Alternatively, however, throughout the entire work, there is some breathtaking and above ordinary fret work in the guitar solos. 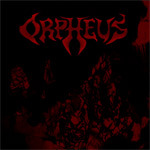 Orpheus' debut is an unexpected and intriguing album which will keep you guessing, but ultimately appreciating the band's inventiveness and musical skill. Recommended.